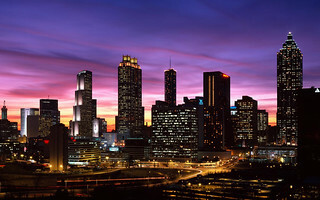 Atlanta, with population of about 435,000, is the capital of, and the most populous city in Georgia. The city is economic and cultural center for a metropolitan area in which lives approximately 5.5 million residents. Atlanta is known as the center of politics, business and the cradle of the movement for human rights, and the birthplace of Martin Luther King. It is also well known and respected center of culture and entertainment. The city is famous for its contribution to the musical genres such as hip hop, gospel, and neo-soul. Below you will find some appealing ideas for date spots in Atlanta. There are many nice spots to taste all flavors of Atlanta's nightlife. 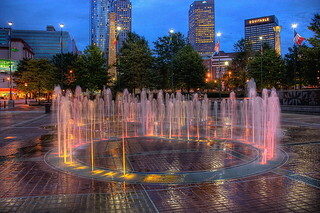 The city is rich in several areas full of restaurants, dance clubs, pubs and bars great for dating in Atlanta. One of them is, for sure, Buckhead with great number of cozy restaurants, pubs always full of people, and loud music clubs. One of the more interesting places to visit is, in our opinion, Fado Irish Pub & Restaurant (choosing a rooftop in the summer is a great idea), which is famous for its laid back atmosphere, simple but tasty food and great beer. Another place that fits great for a date is Divan Restaurant & Hookah Lounge, which offers real Mediterranean cuisine with a Persian flare. Midtown is another neighborhood full of great spots, both fancy restaurants (Ecco, Babs) and trendy clubs (Cosmopolitan Lounge, MJQ Concourse). It is well known for a great dance music and professional DJs. Another popular spot for daters is Atlantic Station, with its variety of excellent restaurants and always full-of-people clubs. If you are hanging around do not hesitate visiting Strip, Kyma, or Lobby at TWELVE. With its contribution to the field of music, Atlanta is a one very important point on the cultural map of the world. The city is well known as a center of hip-hop music, and the place where such stars as OutKast, Lil Jon, Ludacris, or Usher were born or live. The city is also the birthplace of gospel with Gospel Music Association Dove Festival, taking place here every year. Other genres that the city of Atlanta has taken its part in development of are: pop, rock, indie-rock, country, blues and jazz. Dating in Atlanta for arts lovers is easy. The city is one of the few in the whole country where you can enjoy great music (Atlanta Symphony Orchestra), opera (Atlanta Opera), high-end ballet (Atlanta Ballet), and a great theater (Alliance Theatre). The city can by proud of many exhibitions, concerts and shows taking place here and staged Broadway plays. There are numerous theaters in Atlanta with the historic Fox Theatre at the first place – one of the most profitable and most popular theaters in the United States (in the range of 3-5 thousand seats). Also High Museum of Art, a famous artwork museum, located in the southern United States, is placed here. Other places worth mentioning are: Museum of Design Atlanta (MODA), Atlanta Contemporary Art Center, Museum of Contemporary Art of Georgia, and Michael C. Carlos Museum. Atlanta's cuisine combines both local and southern influences. The city has many fine restaurants run by great chefs, often known from popular TV shows. Among them are such stars as, known from Top Chef, Hugh Acheson (Empire State South), starring in Chef A 'Field Anne Quatre (Quinones Room At Bacchanalia, Floataway Cafe) and participant of Iron Chef America Kevin Rathbun (Rathbun's, Kevin Rathbun Steak, Nava) to name just a few. Lovers of good food definitely should visit Buford Highway with restaurants serving delicious Vietnamese, Indian, Cuban, Korean, Mexican, Chinese, and Ethiopian cuisines. Fast food lovers may be interested in the fact that one of the oldest and most popular venues, The Varsity, serving this kind of food, is located here in Atlanta. Green areas occupy around 3622 hectares in Atlanta and include preserves, gardens and parks with the city's most popular and famous Centennial Olympic Park and Piedmont Park, which often hosts various cultural events. Other popular and noteworthy spots, which are the perfect place for a walk during a romantic date in Atlanta are: popular in Woodruff Park business district, Grand Park with its zoo, and the Chastain Park with amphitheatre. Daters who appreciate leisure activities should take a look at BeltLine – a former rail corridor that has been converted into a 35-kilometer loop around the center of Atlanta, providing route for cyclists and walkers. Also Atlanta Botanical Garden with its Canopy Walk is an attractive place for daters, considered the only canopy-level pathway of its kind in the U.S. Dating in Atlanta can be a lot of fun!